I have a working theory: Workaholics Anonymous doesn’t exist because you could never get a workaholic to go to a meeting that wasn’t attached to a budget line or a task in their project management suite. (I use basecamp at my day job and Trello for my sidework.) This conclusion presented itself after more than a decade of hard work and long hours led me to not one, not two, but two and a half full-time jobs inching towards three. (aside) For those who aren’t regular readers here, we’ll recap: Michael works in corporate marketing for franchise companies, he’s an adjunct professor of English at three schools totaling six sections a semester, and he’s running a fledgling public relations firm. I’m not complaining. In fact, I believe pretty much anyone who knows me will tell you that my optimal psychological health, happiness, and stability comes in periods where I lack sufficient downtime to enjoy my drinking time (I heart Martinis) without a keyboard, notebook, or scratch-filled napkin nearby. Right now, in this moment, it occurs to me that I’m burying the lede. (Google that, if you don’t know what it means.) 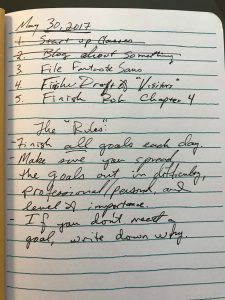 This is a blog about five goals a day, so let’s get to it. I realized I cannot possibly do everything I have to do — the various tasks that come across my life daily, such as replying to a text message from my daughter or picking up my son’s diploma or setting up the new printer in the office, don’t count as the “things” I have to do. There’s a subtle difference between things and tasks in the world of a workaholic. A thing is a goal. An accomplishment. Those activities that, at the end of the day, lead to something tangible. 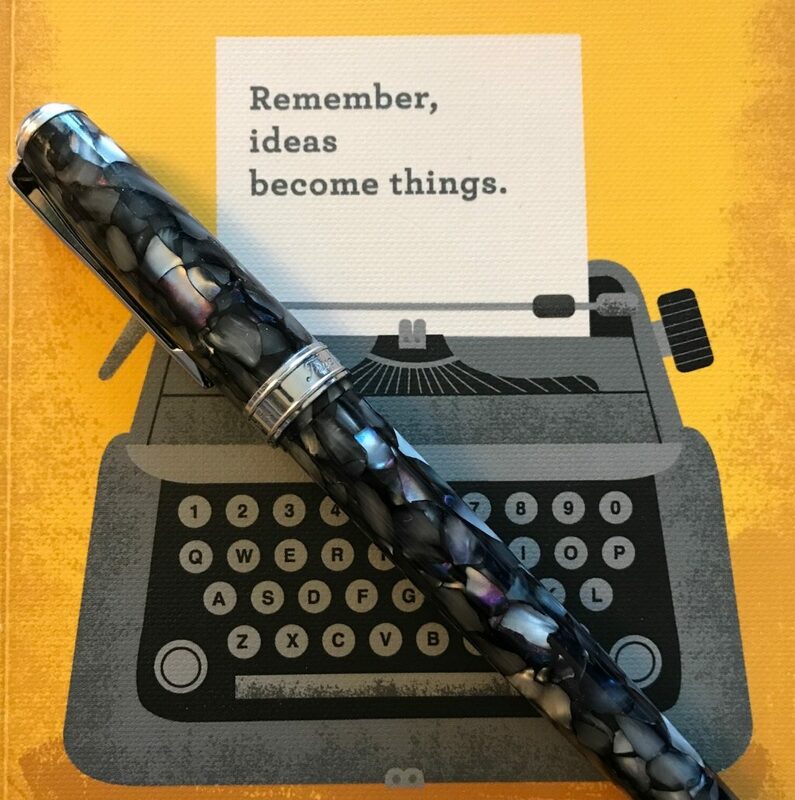 Maybe it’s a press release (for the publicist in me), a chapter of a book (for the writer in me), or filing all the pieces I need to file (for the marketer in me). Sometimes, maybe, it’s carving out two hours to go see Guardians of the Galaxy vol. 2 with the supervillain (for the parent in me). Goal setting is important, I’ve come to believe, because it pushes me. If I set out in the morning with a list of things that I want to accomplish, then maybe I’ll accomplish them. 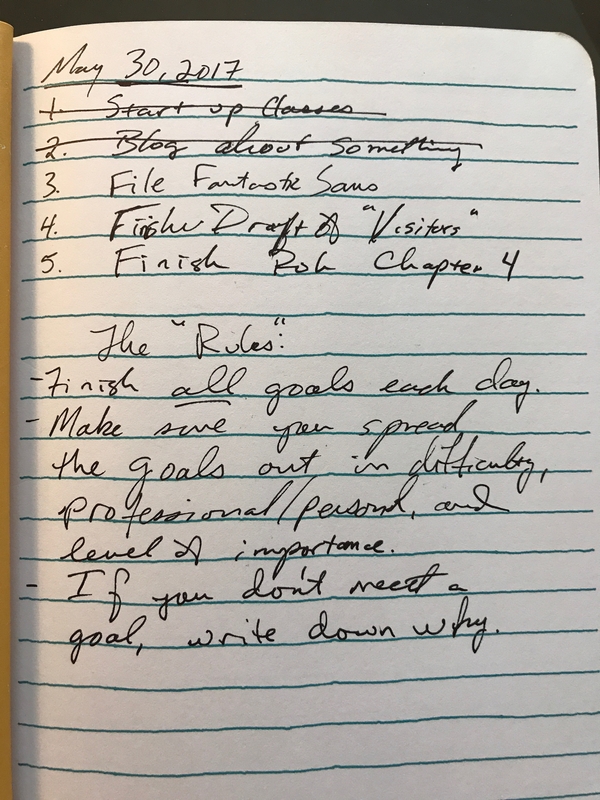 This morning, I realized I needed to do five things a day to meet goals. At least five things, but sometimes more. Every morning, write down five goals. Make sure to spread them out between personal and professional, that you choose goals of varying difficulty, and that the goals are of differing importance. Then, at the end of the day, mark off the ones you’ve accomplished. If you miss one, don’t panic. Simply record the reason(s) why. Here’s what I expect to see: there will be just a few reasons why I’m missing goals over and over and over again — and I do so frequently — and I’m betting those reasons are all the same. At the end of a week or so, I’ll be able to both accommodate those reasons better, because I can plan for them, and eliminate any regular “distractions” whose value doesn’t merit repeat goal missing. I once had dinner with Dee Wallace, who wrote a book called Conscious Creation. Over the course of dinner, I mentioned there are “three me’s” — the writer, the marketing guy, and the teacher. I said, eventually, I expected one of them to win. She said, “Why pick? You can be all three.” Maybe she’s right. And maybe, this will help.